We might not like to admit it but deception is deeply entwined with life on this planet. Insects evolved to use it, animals employ it in their behavior, and of course, we humans use it to manipulate, control, and profit from each other. With this in mind it’s no surprise that deception appears in various guises in user interfaces on the web today. What is surprising, though, is that up until recently it was something web designers never talked about. There was no terminology, no design patterns, and no real recognition of it as a phenomenon at all. If it wasn’t a taboo it certainly felt like one. To fill the gap, darkpatterns.org was created in August 2010: a pattern library with the specific goal of naming and shaming deceptive user interfaces (aka “dark patterns”) and the companies that use them. This article will provide you with a brief overview of the library and some specific examples of dark patterns in use today. If we put aside our moral quibbles let’s put ourselves in the shoes of an evil web designer for a moment. How can we take advantage of our customers in the most effective manner? First off, subtlety is our friend. For example, if our site is going to hit users with hidden costs in the checkout process, we’ll be more effective if we add relatively small costs. If we add $100 to a $20 purchase, the customer will most likely notice and drop out. We’d be much better off adding just a few dollars as some sort of “order processing fee.” Even if customers notice this, they probably won’t bother dropping out as the cost is too small to justify going through the checkout process on another site. This is why deceptive user interfaces are so common on the web—in isolation they’re usually so small that each one is barely annoying enough for people to do anything about them. Bury facts within paragraphs of text, so some users will proceed without fully understanding the transaction. Ensure default options benefit the business, even if this means some users convert without meaning to. Hand-pick positive feedback and display it prominently. Bury negative feedback so it is hard to find. Dark patterns tend to perform very well in A/B and multivariate tests simply because a design that tricks users into doing something is likely to achieve more conversions than one that allows users to make an informed decision. As an exercise, take a look at the three examples below. Each takes a different approach to eliciting users’ marketing preferences. Which do you think would win an A/B test by achieving the most marketing opt-ins? And which do you think is the most ethical from a user’s point of view? Fig. 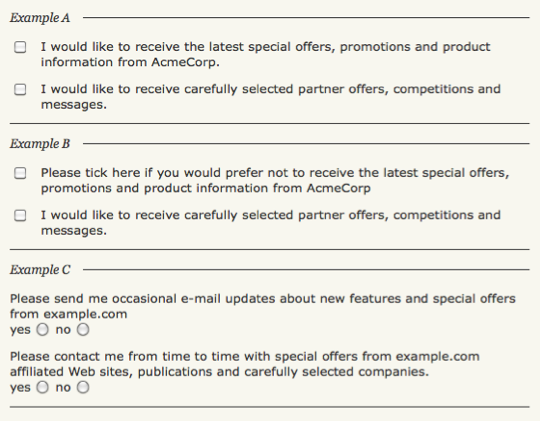 1: Which example do you think might perform best in an A/B test? Example A is basically honest. Checkboxes are opt-in with clear labels. If the user happens to ignore the area completely, they will not be signed up to any marketing messages. Although this is kind to users as it avoids accidental opt-ins, it is also bad for business as conversion rates will be relatively low. Example C is another honest interface: a user cannot submit the form without selecting an answer so they are forced to make an explicit decision. On the other hand, Example B is quite devious, and because of this it is likely to win in A/B tests. Double negatives are used in the first checkbox label but not in the second, which will confuse some users. Those who ignore both the checkboxes will unknowingly give some marketing permissions, while those who zealously tick both checkboxes will also end up giving some marketing permissions. In other words, this kind of trick question is like a trammel net used in fishing, which uses different layers to entangle prey in different ways. As you can see, blinkered and over-zealous A/B testing may actually be causing the web to evolve toward dark patterns. The lesson here is that you should never rely on a single method and a single metric to understand your customers. Their opinions, feelings, and trust in your company are far more broad ranging than their behavior in a single split-second on your website. If used properly good old-fashioned face-to-face usability testing can provide a great antidote. A highlight video reel containing footage of customers swearing about your website can make even the most hard-headed CEO sit forward and listen. However, usability testing can be quite expensive and typically delivers qualitative data. A quant-centric company is unlikely to change its spots overnight. Let’s take a look at another example. One of the biggest problems with the freemium business model is the low conversion rate from free to paying customers. Many businesses deal with this problem by offering free trials that require credit card details upfront, which automatically transition users to a paid plan after a set time. This forced continuity and can be applied both ethically and unethically, with many shades of gray. At the most honest and user-centered end of the scale, we have Apple’s MobileMe. When signing up, the service makes it extremely clear what you are getting into as a customer (Fig. 2, below). It doesn’t hide anything in small print or complex wording. Then, when you’re seven days away from transitioning to the paid plan, they email you a reminder of what is about to happen. In other words, they couldn’t make it any clearer at any stage of the process. Fig. 2: The explanation at the top of the credit card form of MobileMe.com is very prominent and clearly worded. Let’s move down the scale to a slightly more questionable approach. One well known DVD rental company gives great upfront messaging about the rollover from a free to paid plan—just like Apple does with MobileMe—but they don’t send out reminder emails. This means that some customers will inevitably forget what they agreed to and find themselves charged monthly, only noticing when they check their credit card bill. Does omitting reminder emails make this UI less honest? This isn’t an easy question to answer. The costs associated with mailing physical objects around the country are structured very differently to an online service. We know for a fact that reminder emails will reduce the conversion from a free to paid plan, and if their margins are thin, this could make the free trial model loss-making and therefore unviable. Now, maybe you’re thinking that this kind of ethical hand-wringing is somewhat naive. Of course there will always be tension between businesses and their customers. Both have self-interests—a sustainable relationship is only created when a balance is achieved between the two. Classic economic theory says that market forces will provide a self-righting mechanism, and that customers will shop elsewhere if a business does not provide a compelling service. However, this theory also assumes people behave with a perfect knowledge of all economic opportunities and attributes (a.k.a “Homo Economicus”) a point of view that is widely refuted by behavioral economists. If a business is successful at deceiving some of its customers in a subtle manner, the majority of customers will not know or care, so they will have no reason to shop elsewhere. Fig. 3: The continuum from honest interfaces to dark patterns. Now let’s look at the least honest end of the scale. One well known credit rating service uses forced continuity in a very deceptive manner. 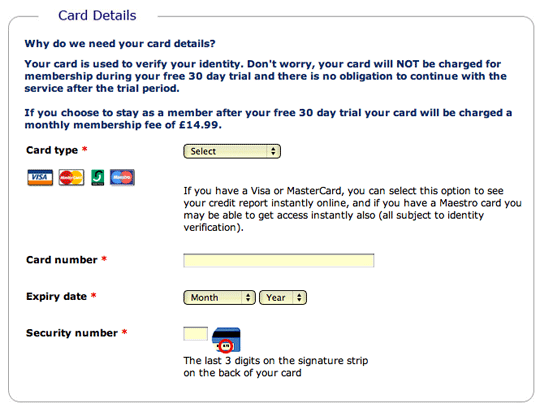 As well as not sending a reminder, they use some very cunningly written copy on the credit card form (Fig. 4, below). As we all know, people tend to start reading at the beginning of a piece of text and as they advance, an increasing percentage of people give up and do not read to the end. This common reading behavior is the reason why the inverted pyramid style was invented: to assist readers with a concise and accurate summary up front. As you can see below, the designers of this website have applied this understanding of human reading behavior to nefarious ends. Fig. 4: Black hat copywriting: this text has been purposefully crafted to mislead. If you only read the question and the first line of the response the copy appears to be saying one thing—that the only reason you are being asked for your credit card details is to allow identity verification, as part of the credit checking process. But, if you read all of the text word for word, you will see it actually means the opposite—that your credit card details are being taken to bill you on a monthly basis. What’s clever here is that the level of deception is very subtle. Although it’s likely to boost their conversion rates, it also steers clear of any legal issues. Some businesses implement dark patterns by mistake or misadventure. The tricky problem for them is that they can become accustomed to the resultant revenue, and unlikely to want to turn the tap off. Nobody wants to be the manager who caused profits to drop overnight because of the “improvements” they made to the website. However it can be done. Until mid-2010, Expedia-owned travel site hotels.com hid costs from the user until the last moment in the checkout process (e.g., “extra guest charges,” “taxes and fees,” etc. )—which made the site look like it was offering cheaper deals than it really was. In late 2010, they redesigned the site to use a more honest interface which clearly states full prices up front on search results pages. Since then, they have won numerous awards for customer service: including the TUV certificate in Germany for safer shopping, and the best online site in Denmark, and they were voted top in the ‘Service’ and ‘Customer Friendly Website’ categories by the German Institute of Service Quality in January 2011. Removing dark patterns from any site involves a leap of faith. A company has to shift from a short-term quantitative measurement mindset to one that values relatively slow, steady growth of “warm fuzzy” qualitative things like brand image, credibility, and trust. This kind of cultural shift is hard to do, which partially explains the reason why dark patterns tend to stick around once deployed. When we heard that some listeners have found our check-out process less than clear, we took it upon ourselves to refine the wording of our offers and clarify our recurring billing practices. […] We invite the Dark Patterns community…to review our changes. Sure enough, the new version of their site did away with the offending dark patterns and has been well received. This is a great example of how a grass-roots wiki can have a positive effect. The way a company reacts after being outed speaks volumes about its real intentions. At least now we have a precedent for exposing them and demanding change: companies determined to use dark patterns will have to factor in the cost of negative PR. With continued pressure from the design community we can make a difference. Harry Brignull is a user experience designer working in Brighton and London. In his career he has worked on a diverse range of design problems, from iPad apps to self-install broadband packages. He's @harrybr on twitter, and he also blogs at 90percentofeverything.com. i’m fairly savvy in my web purchases but recently purchasing air tickets on orbitz.com i ended up somehow signing up for travel insurance. given i don’t fly often, i have yet to duplicate the process that got me there, but i checked each step and yet this unwanted purchase still got applied to my creditcard. perhaps others have had similar experience. If you’re using deception, you’re not _profiting_ from other people, you’re _stealing_ from them. *Profit* is the value you create for your customers. In every voluntary non-deceptive trade (including hours for dollars), both parties benefit according to their own values. I don’t think that honeybees lie when they waggle their tails and dance to show where the nectar is and how much of it there is. I often think of honeybees working hard with innocent enthusiasm as I look around at what people do. Question: Thinking about the business model that offers a free trial (no credit card taken) and then stops access to the account after the trial period unless the user signs up for a paid account – is that deceitful or honest? I think it is plainly honest, but I wonder what your view is? @bloodnok – you might find “this BBC watchdog article”:http://www.bbc.co.uk/blogs/watchdog/2011/10/travel_insurance.html interesting, it’s about travel insurance dark patterns. @uberbaud – that’s not the definition of “profit” used by accountants and economists, though I agree with your general sentiment. @DavidBennett – I think honeybees are fine, upstanding members of the insect community. I was talking about “these guys”:http://webecoist.com/2009/08/13/6-deceptive-insects-that-arent-what-they-appear/ . Re: your idea of a business that offers a free trial with no credit card up-front: there’s nothing deceitful about that, but if the free trial is expensive for you to run then you’re in trouble. This is simply sales 101. I love the honesty of the author and how he paints the views from both a customer vs business slant. The key here is highlighting what needs to be featured as a benefit to the user, and adds the most value to the business. Burying facts within paragraphs and calling it deceitful may be left up for interpretation, however there is much to be noted here with this technique. Which paragraphs are we addressing? Paragraphs within the content spaces on the user facing site? Or paragraphs within the fine print? Key issues that determine a sale or not can be brought to the users attention in a way that it’s not highlighted. I find these days that there not not too many, “By signing here you agree to give up your first born…” type flags that would hinder a successful sale online. More and more, business are become very upfront and honest about revealing red flags to their users in order to avoid the backlash of social stigma. A good company knows that it’s not these “hidden deceptions” that drive business, but rather, its the social verdict and praise they receive providing a fantastic, hassle free user experience. I’m not sure what it says about human behavior when it comes to business settings or opportunities for making profits, but it seems that we need reminders like this about being honest. I cringe whenever a misleading design concept is thrown on the table for consideration. It should not be done and I don’t understand why people think that since it’s ‘business’ that being dishonest is ok. This is all true. But consumers need to be wary in any transaction both on and offline. I’m glad there’s a group keeping designers aware of this trend. What’s the best way to educate colleagues on the risks if the company insists on using these methods? Also, there must be a way to alert users during or after a testing scenario and to get their reaction to these methods. First of all thank you Harry Brignull on what was a well thought out and concise article dealing with a subject that has in a wider framework taken up too much of my working life. This is the first time that I have seen someone approaching this in a scientific and logical manner and I was pleased to have at last found someone who has written about what I would term “the ripp-off” in such a formal way. 1. Cannot read small print. 2. Cannot read light grey print against a slightly darker background. 3. Do not have time to read many many pages of technical gargon to find out if there is a “conn” somewhere (Apple, while selling iPods, present hours of reading material to customers who have already paid the money, to find out that they are restricted in ways that only a lawyer specialising in this subject will be able to understand, let alone decide one way or the other). 4.Are not prepared to be vigilent every time they buy something but wish to relax and have an enjoyable time “shopping” rather than be constantly on the look-out, even with “reputable” companies. We are all going to get old and decrepid and vunerable. We will thus be subject to the various “tricks” that the new generation can think up to “make a buck” from those who have reached that stage and find it perfectly legitimate if the customer is “not in his right senses” to “take the profit”. The only way to stop this trend, as indicated, is to present the profit takers with some consumer “tricks” which some of us are now keen to use. These can be spread through sites such as this, through “consumer rights” services and any other “legitimate” path, in order to protect ourselves against unethical sales methods. It is this dark-pattern defence (DPD) which I find most constructive, and is an ever increasing self-defence mechanism which is necessary in order to partake of the “western free market”. It will continue to expand and pass from word of mouth and mail to mail, but will remain “underground” so that those using unethical techniques will slowly see their margins fall unless they use more and more devious methods to catch the customer. This will be their own self-destruction, the results of which are happening right here and now on the streets of all our capitals all over the world. Those who remain at home afraid but nodding in agreement are possibly an unrated majority? It is in some sense a war and of course it is much more interesting to be on the side of the common man rather than the “big industry”, since as we see in real wars, when the common man is equiped with some solid techniques (remember the French Resistance, or more up to date Afghanistan? ), no matter how large the weapons, no matter how much finance has been invested into tricking people, the common man will retain his human kind self, as long as he remains conscious of the fact that it is only “money” that these others are after, and not his soul. I agree that many websites are using deceptive techniques (save the worst for last) but the good guys should shame their more nefarious competitors. I’d love to see websites stating “we do not charge a credit card processing fee – why should we?” and I’m sure customers would react positively. Marketing gets a bad reputation because scammers use marketing and some marketer push the boundaries. Marketers can learn from these examples and increase response rates, affect customer behaviours… but should think about the long-term. Long-term your image, reputation, trustworthiness and a loyal customer base who are willing to recommend you is a more sustainable business model. This is a really interesting article. As a junior website designer with a highly honest firm that aids in website design and branding for small businesses, I feel as though we tend to naturally and unknowingly steer away from dark patterns. And it seems like this issue is more prevalent with ecommerce and larger businesses. But because honesty and straight-forward language is a very integral part of designing an honest, successful website, this is a great reminder to keep this idea in mind when designing to make sure customers of our clients fully understand the nature of our clients business. Thanks for a fascinating thought-evoking article! Delta.com is very sneaky and charges a $420 international travel fee (yes, no kidding) to make the “price” of the ticket seem lower. Moreso durig the checkout process they make it seem like it’s an additional fee to the government imposed TSA security fee (which by comparison is a lot smaller). The initial reaction is to get pissed at the govt. and think that all airlines have it, but it reality it’s just what Delta charges directly in addition to the “price”. Beware! I agree with some of the sentiment expressed in the article. But the kind of ‘deception’ being used here seems no different to any other form of marketing or sales technique. I suppose the question is should web professionals really try to hold themselves and their clients to a higher standard than the rest of the marketing/sales world. Yes, sometimes it pays off if your site gets a reputation for being particularly honest, but in general you’re just throwing sales opportunities away – and most of us aren’t in that business.